I was going to hold off posting my bead warriors since Dale just posted, but he encouraged me to go ahead and post. Over the weekend I put together three stands of troops. I will discuss the building process, the painting, and then also my subjective feelings about these little fellows, both good and bad. In terms of historical miniature gaming, I am one of those people that has one period that I like significantly more than all others. For me that's ancients, and specifically ancient warfare from about 500 BC to around 100 BC. Because of this, I am a sucker for Alexander the Great and the Successors battles in particular. So, not surprisingly, this is the army I started with when doing my first batches of bead warriors. Over the weekend, I got three bases done, two phalangite bases and one skirmisher base. I try and use everything from a craft store or online craft shop, so even the bases are precut ones that I buy online for not much money. They are about 3 inches wide (just a little shy of that actually), 1.25 inches deep, and 1/4 inch thick. 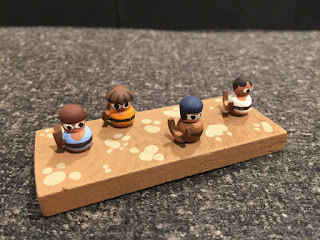 I wanted thick bases for these little fellows because a) I think it looks cool, and b) while in play I want people handling the bases, not the figures. They are essentially painted the same as my "28mm" wooden ancients figures I make using spools and such. So they are way more "meeplish" than Dale's figures in appearance. Here is a closeup of the phalangites. And here is what they are made with. The body is a 5/16" Flat Head plug, and the head is a Maple Button Plug 1/4" in size. You just glue the mushroom plug on top of the wider end of the flat head plug and that's it. 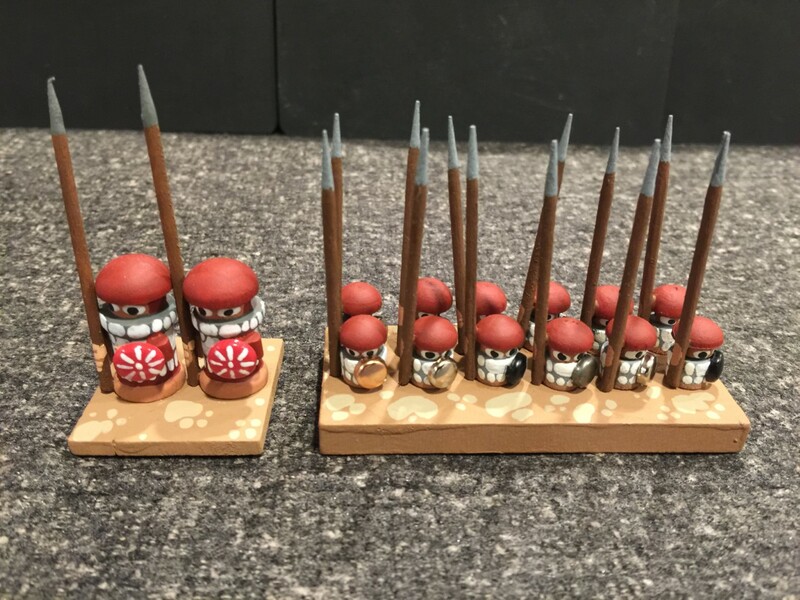 The pikes are toothpicks with the sharp end cut off of one of them. The shields are called "brads." You get them in a craft store in the area that has the paper and scrapbooking stuff. They are designed to hold pieces of paper together as they have two sharp prongs that you can bend open and then shut again to hold the paper, but I snip those off. 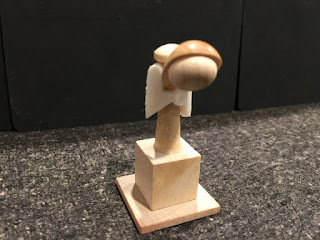 Honestly, this is just a 10-12mm version of the same figures I do at 28mm with spools and mushroom caps, it's just that the mushroom cap is smaller, instead of a spool for the body I used a flat head plug, and the brad I use for the shields is smaller. To illustrate this, here is a comparison photo of the 28mm phalangites I made years ago, and the new 10/12mm phalangites I made this past weekend. As far as painting goes, very, very easy. Dale is right, you can really get lost in painting details that don't matter. What I tried to do was identify what was the most distinctive thing on the actual soldier and just paint those things. So for the phalangites, it's obviously the helmet and the linen armor. The linen armor pattern is just made up, it is just a "suggestion" of the linen armor. You can't really see it in these pictures but I did paint hands on the back side of the pikes to give the appearance of them holding it, but that's it for details. Helmet, face and eyes, linen armor, and that's about it for painting details. For my skirmishers, I wanted to try and give some variety in appearance. 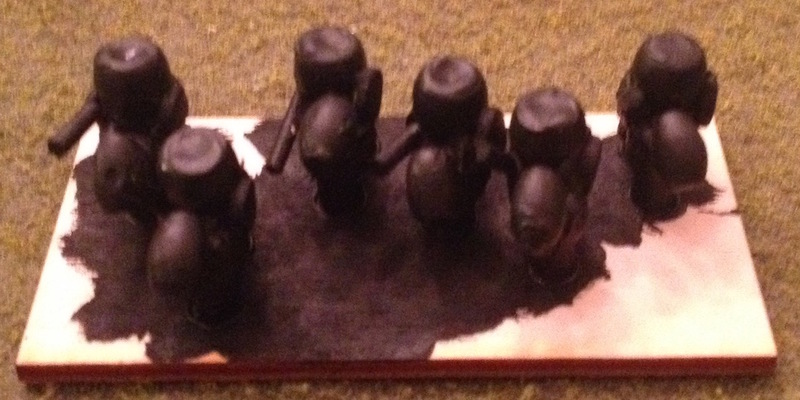 Also, obviously, there are way fewer of these figures on the base, although the base itself is the same size. Here is what these guys are made from. 1. Inexpensive. Even me buying "custom" parts instead of just going with the standard beads from a craft store, they are still really cheap to make if you buy the pieces in bulk. 2. Fast to paint. Wow, I literally did the bases staggered, so that I was at a different point with the painting of each so that I could be painting one while another one was drying. For these three bases, with a total of 28 figures, I may have 3 actual hours of work in them, and honestly, a lot of that time was waiting for the glue and paint to dry. 3. Mass effect. Just like with all 6mm or 10mm figures, you can get so many of them in a small area on the board it looks really good, even with my cartoony meeple style, they look good when they are put together like in the first picture. 4. Light. 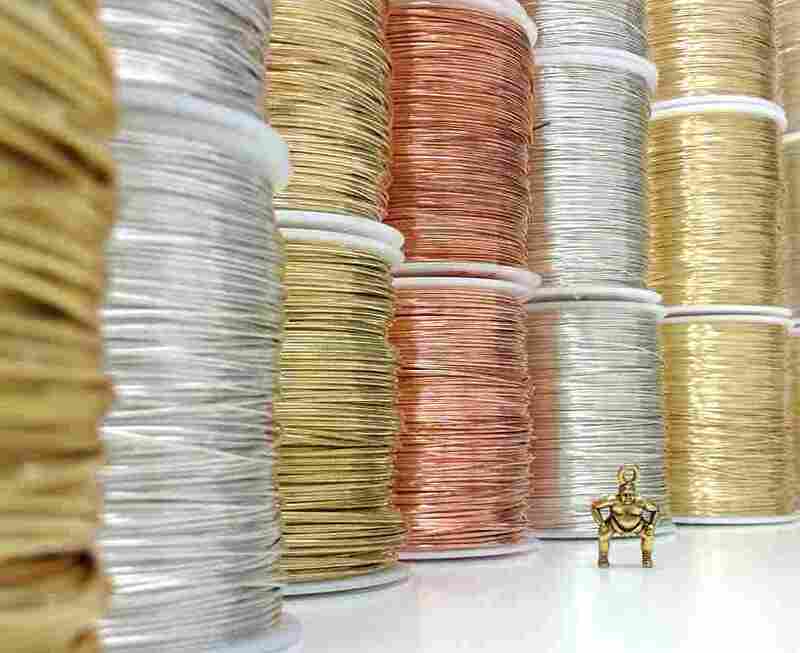 Especially if you used a thinner wooden base, you would find that each base weighs less than one 28mm metal figure. Actually, I think even my thicker bases still weigh less. 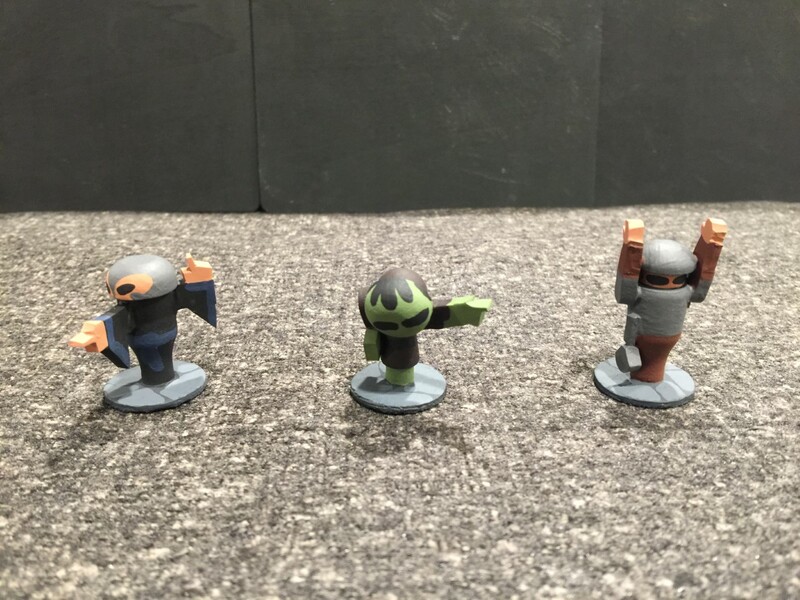 So for those of us like me that like to run convention games, or run games at a gaming club where you have to transport everything, my old back is very happy to be moving a box of these guys around compared to a box of 28mm metal figures. 1. Fiddly. There is no real way around this unless you do what Dale does which is paint them on the base. I don't do that, and by not doing it they are hard to hold onto when you paint them. 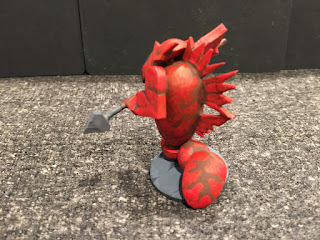 The phalangites are not, you can hold onto the pike, but the skirmishers and the base of Hypaspists I am working on now, it is impossible not to get paint all over your hands. 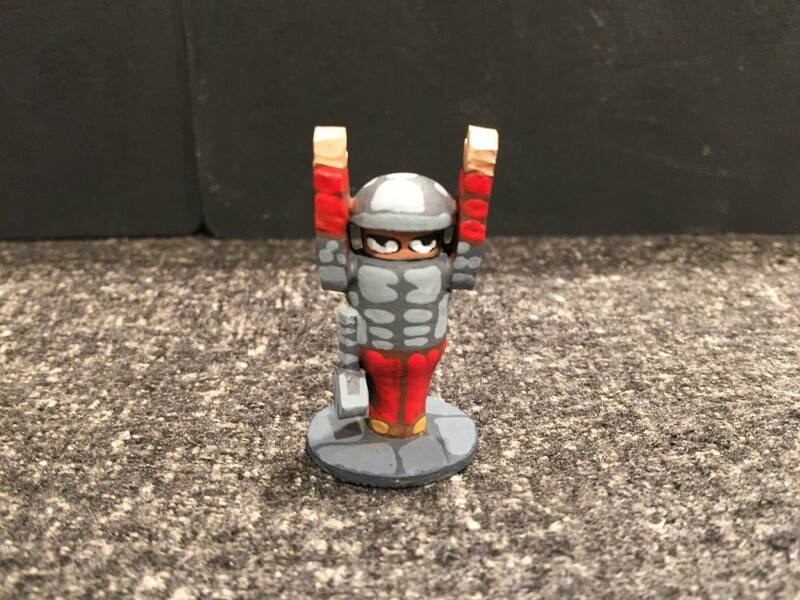 In the future I might try to use some sort of putty tack to stick them to a base that I can hold onto when painting them. That should help to solve this problem. It's always risky with wood, though, because it absorbs everything, so if the tacky stuff is damp at all, the wood will absorb it and possibly alter the paint. I hope not though. 2. <Yawn>. Okay, I admit it, I can be a bit of a painting snob. 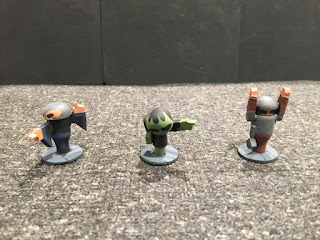 Painting these guys this weekend made me feel the same way that painting 6mm figures made me feel when I used to paint them. <Yawn> On the good side, it's hard to paint them poorly. On the bad side, it's very difficult to paint them very well. This is definitely a double-edged sword characteristic, because if you wanted to put together an army quickly that looks good on the table, but you didn't care if they looked great, just to try out a period that you do not normally game or something like that, they are perfect for that. But the point of them is to be minimalistic, and simple, and paint just the most important elements of the figure. That's great for speed, and for identification on the table top, but for those paint snobs like me out there, it can get really boring really quickly because it is very assembly-line like. 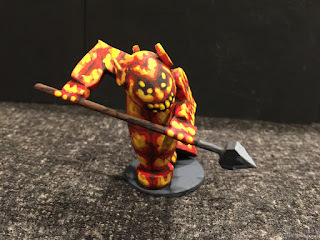 So for me, personally, the level of enjoyment in painting them was far less than for the 28mm ancients I have done with the spools, and definitely less than for the 32mm fantasy figures for rpgs I've been doing of late. Will I keep doing some? I will. I want to do an elephant, and I want to do some cavalry. I will eventually do enough to put on a game. I like a huge battlefield with lots of troops on it and this will really fit that bill. Actually, I sort of like knowing that between even just Dale and I, we have 10/12mm army options, 25/28mm army options, and 40mm army options for figures made out of inexpensive and simple craft store parts. I, personally, think that diversity in scales for these types of figures is just darned cool. I went to the local Michael's and found a cheap ($3) hot glue gun and said "Why not?" because my experiments with super glue had pretty much failed. 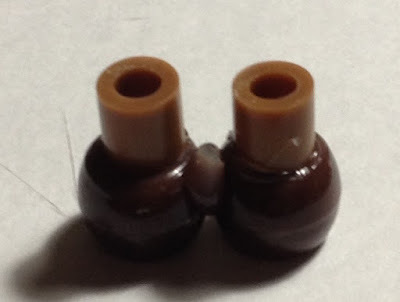 Super glue just does not provide a strong enough hold when dealing with curved, plastic pony beads. Pony beads are basically 6 mm x 9 mm plastic beads with a large hole. I use two of these for horses, acting as the body. To each of these I attach a 3 mm by 5 mm plastic, tubular bead. Here is what it looks like attached. I usually fill up the pony bead with hot glue first, then attach the "legs". 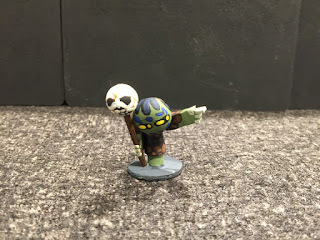 When attaching the front and back sets together I connect them with a spot of hot glue and then let the glue harden. Although hot glue will typically set in 15 to 30 seconds, unless you are using cold water the glue generally takes a few minutes to harden. After it has hardened, I add more hot glue at the join point between the two pony beads, deliberately leaving a blob towards the bottom (above the horse's legs) as this gives the appearance of rider's legs. 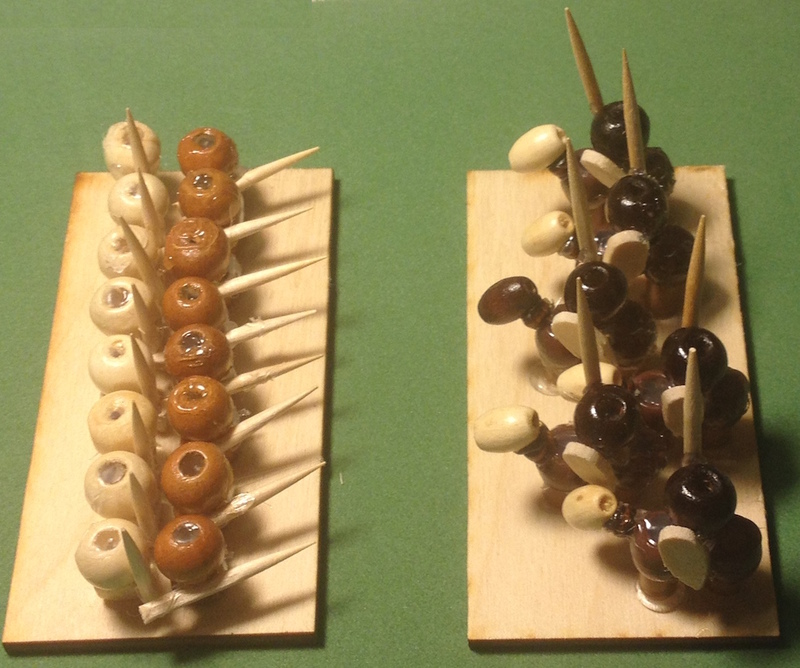 As you can also see in the image above, I use a wooden, tubular bead for the horse's head (the light colored bead). 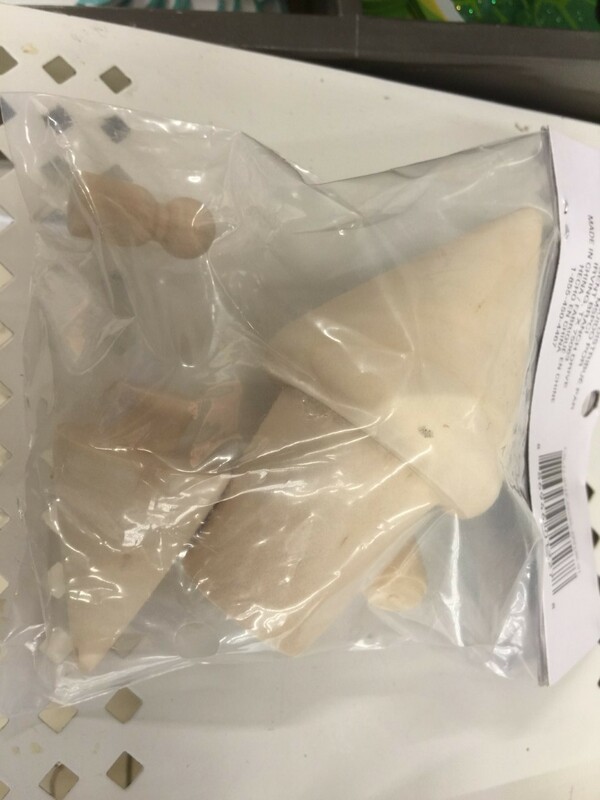 All I can say about it is that it comes in a package of wooden beads with varied shapes and sizes that I buy at Hobby Lobby and it is the perfect size. Those five beads complete the horse for a 12 mm figure. For the rider, I only need two more beads, one for the head and one for the body. Because these figures are sort of Chibi-style, with an oversized head compared to the body size, the rider's head is either an 8 mm round wooden bead or another 6 mm by 9 mm pony bead, depending upon which shape suits your subject better. (The pony bead provides more of a flat-topped barrel shape, while the wooden bead is a spherical shape.) The body is a small "seed" bead. It does not need to be as large as the body used for infantry as the rider's legs overlap the shape of the horse's body and is represented by hot glue. 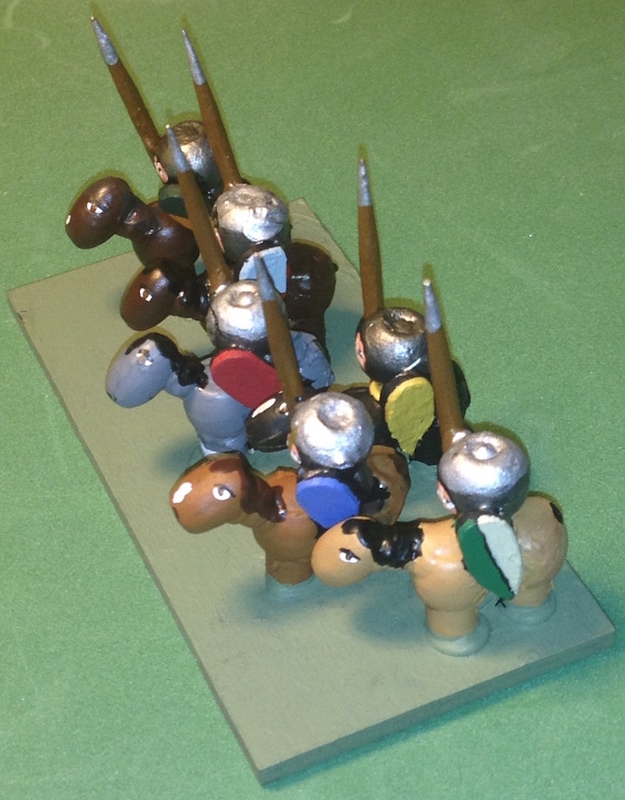 Here are six cavalry, armed with swords and shields, shown at various angles. 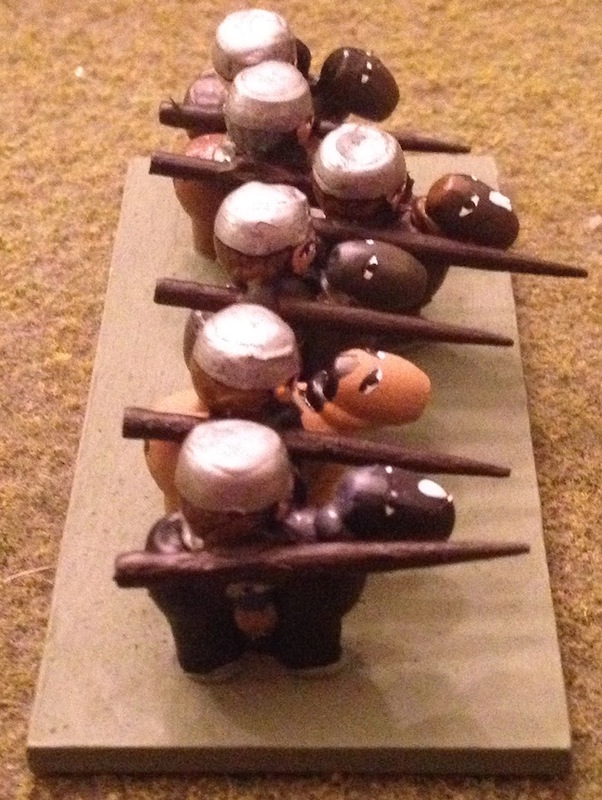 Some cavalry with spears in upraised position. 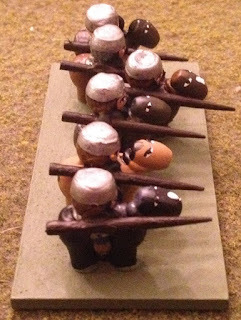 Some cavalry with spears in lowered position (charging). 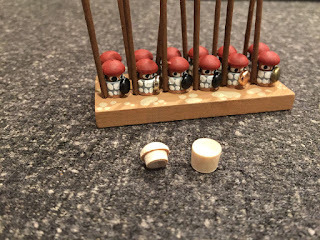 All of these cavalry use pony beads for the heads, so will be better for medieval knights with barrel helmets, although the shields are not really the right shape for heater shields. But that is okay. I am trying to train myself that it will be the paint job and not the shape that will matter as much. So far I have finished six sword-armed cavalry and 12 spear/lance-armed cavalry, plus 16 infantry in shield wall formation. So let's look at the infantry. 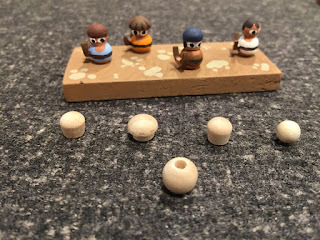 For these guys I used two beads, an 8 mm wooden sphere bead and a 6 mm wooden cube bead, hot glued one on top of the other. (The cube is the body.) 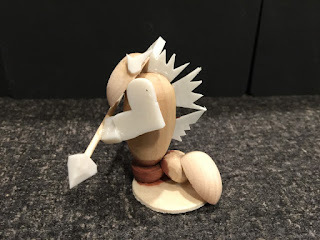 To that I glue a piece of foam sheet cut out with a hole punch, which represents a shield and part of a wooden round toothpick to represent the spear. I only put the shield on the front row figures and the single back row figure where the shield would show. As you can see in this image from above, adding shields to all of the figures in the back row is not necessary as they would never show, unless you created a sufficient gap between the two ranks. But if you did that, then you would be able to see the fronts of the second rank sufficiently that you would then have to paint it. That defeats the point of this minimalist style. Once I paint these all up with black gesso a lot of the little holes and gaps will be filled up, in addition to acting as shadow for any area I cannot or do not paint. Here is the first infantry unit that I have finished. I have painted it all in black gesso in order to create shadows for wherever I cannot paint another color. I will only paint those areas of the figures that are easily seen. Hard to see places will be kept black. This unit will likely be an Anglo-Saxon fyrd unit. No armor, a couple of helmets (mostly caps), and lots of colors. In terms of Dux Bellorum, it will be an Ordinary Shieldwall unit. As this unit is more orderly, it will be an Anglo-Saxon select fyrd unit. They will have body armor and metal helmets. In terms of Dux Bellorum they will be Noble Shieldwall units. 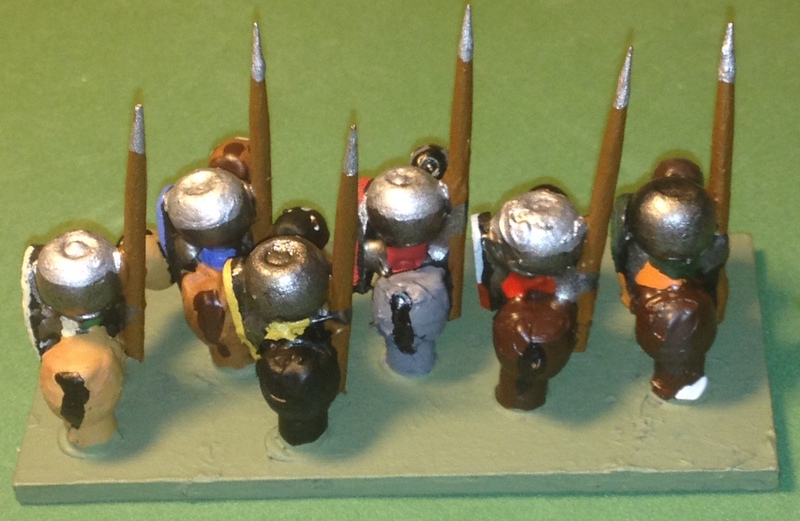 Here is another Anglo-Saxon fyrd units (Ordinary Shieldwall), painted up. As you can see in the images above, lots of color in the clothing (the square bead) and in the hair color, caps, and helmets. The main point of emphasis to the eye, however, is the head from the back and the spear points, shields, and heads from the front. Lots of detail on the clothing or shield is wasted. I allowed myself some dots, stripes, and spirals for the shields, but I was not going to paint any animals or Celtic knots, that is for sure! Opposing the Anglo-Saxons I wanted to use the Sub-Roman Britons. At first I thought about using the SRB in the Southwest of England, but later realized that the Kingdom of Strathclyde lasted much longer and had more enemies it could fight (lasting until the 10th century or so). Plus, they can be an all-cavalry force, if you want them to be! I thought that would be fun – cavalry and light, skirmishing infantry against a shieldwall – so I decided to make a few cavalry units. This first one is sword-armed, just so it can be a little different from the rest. It will likely end up as the General's stand, or in Dux Bellorum, the Noble Companion Riders. Here is a unit of Strathclyde cavalry. I will paint them with a few helmets and no body armor, making them Ordinary Riders for Dux Bellorum. They are armed with javelins and spears. This Strathclyde unit has everyone wearing metal body armor and helmets, no count as Noble Riders. 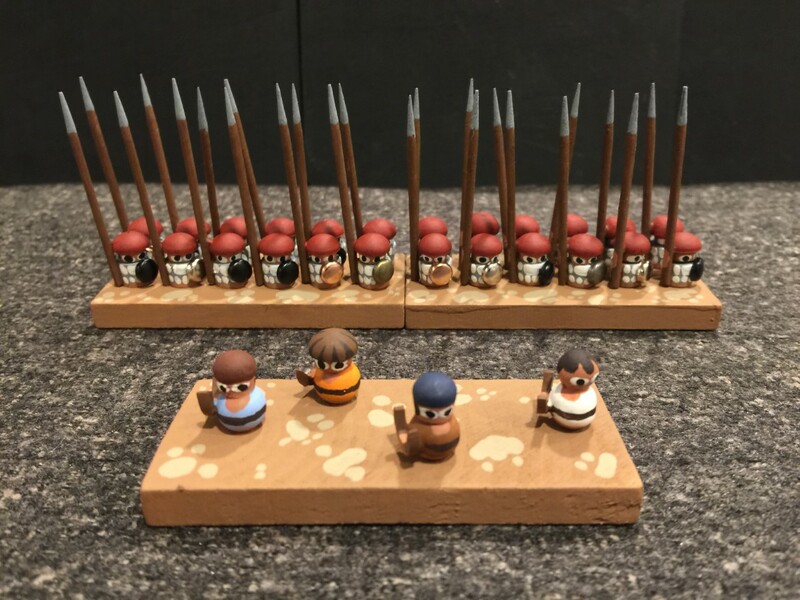 The weaponry are javelins and spears, so they will use their firepower to wear down the enemy before charging into them and breaking them. That is the plan at least. As you can see, I really did not put a lot of effort into the shields. (I also forgot to paint the spear points!) The good thing is, I can always go back and paint a little more if the mood strikes me. The ones that have shields on the outer edge of the stand (the red one, in this case) and are easily accessible (the white one and possibly the orange one) would be the likeliest candidates. Maybe a simple two color scheme with painted halves, stripes, or dots. Plus iron shield bosses in the center. So, all in all a pretty productive trip. 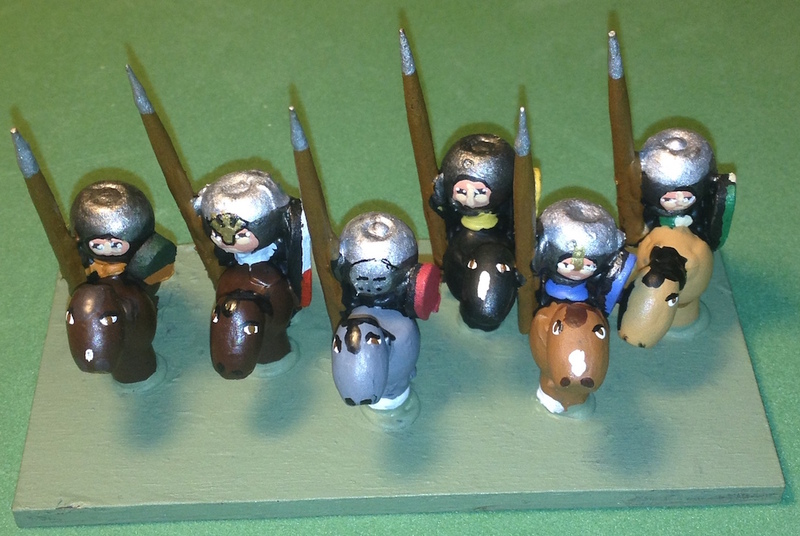 I still have three more cavalry units to add weapons and shields to, but the horses and riders are all done. I stopped doing infantry because I was worried that they would not survive the trip. As all of the infantry in a unit were glued together in one big block, that made them less flexible. So I glued a couple of dozen heads to bodies and left it at that. It is all coming together nicely. If the Dux Bellorum rules do not work out, there is always DBA (with 3" bases!) and several other rules I would like to try (like Conquerors and Kings). Thought I would post a few more painting shots. 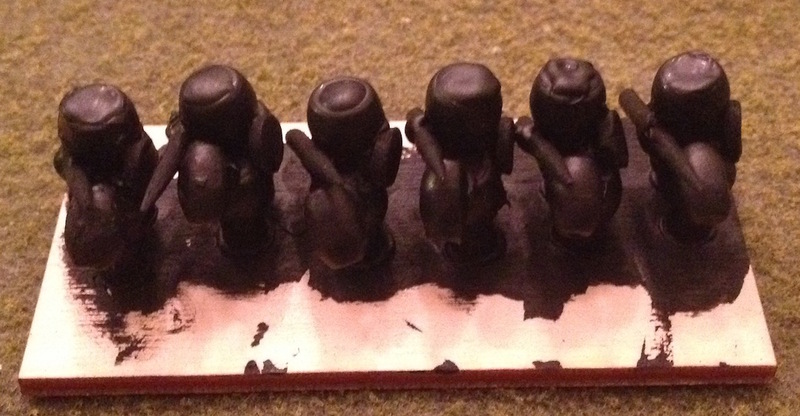 These are the base coats with the eyes for three figures, one of which, the orc shaman, you've already seen. The one on the left is an evil wizard/necromancer and the one on the right is a warrior priest summoning some magic effect ... or signaling for a touchdown, whichever you prefer. The Wizard has the standard cloak I usually do but I wanted him to have a metal skull cap on his head, similar to the one worn by Merlin in the classic Excalibur movie from the 80's. These are all base colors and you can see that for all of them, I chose to do a black eye base. 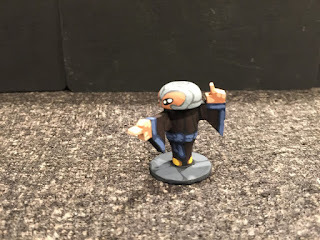 Here is the finished evil wizard. The eyes are done by just putting two white dots into the large black oval. 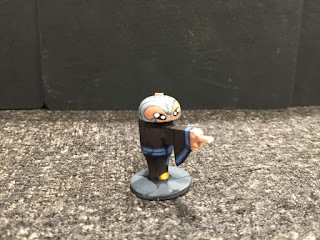 The cloak is the dark brown color I like so much as a base tone, but in this case because his cloak is so dark I painted the base coat black, and used the dark brown (the "Soft Black" color) to fill in as the color of his cloak. This is a good example on a human figure the technique of leaving some of the darker undercoat color showing through when you use a lighter tone over top of it. It is done on every part of the miniature except for his face. Finally, here is the evil warrior priest finished. He is pretty straightforward except for his eyes. I wanted him to appear to be looking up, so I used the same technique for the eyes that I use on the zombies. The white part is not just two dots but a crescent shape so that it looks like his pupils are all the way up in the top of his eye, which they would be if he was looking up to the sky summoning the power of his god. The mace on his belt is just cut from a tile spacer. Finally, Michael's, at least the ones where I live, are carrying a new line of wooden craft parts that have different "wooden people." I've not seen these before. Also, they have this pack that has a male and female wooden person, a hut, and a tree. Unfortunately it is about $4 and I would never use the hut for anything I don't think, but I really like the tree. I took this picture at the store and it didn't turn out as good as I hoped, but you can see the people and the tree okay in it. These people are a nice size and if I was starting over or wanting to do a really large army, I might opt to use these. The hut looks like an ice cream cone, but the tree (which is next to it but is upside down) is actually very nice, this picture does not do it justice. You can see one of the "pawns" or "wooden people" in the upper left of the package. Unfortunately, I don't think you can but the trees in a pack by themselves (like a four pack or something). I only saw the trees included in this package, and it is cost prohibitive to pay that much just for one tree for me, anyway. But it is a very nice tree. 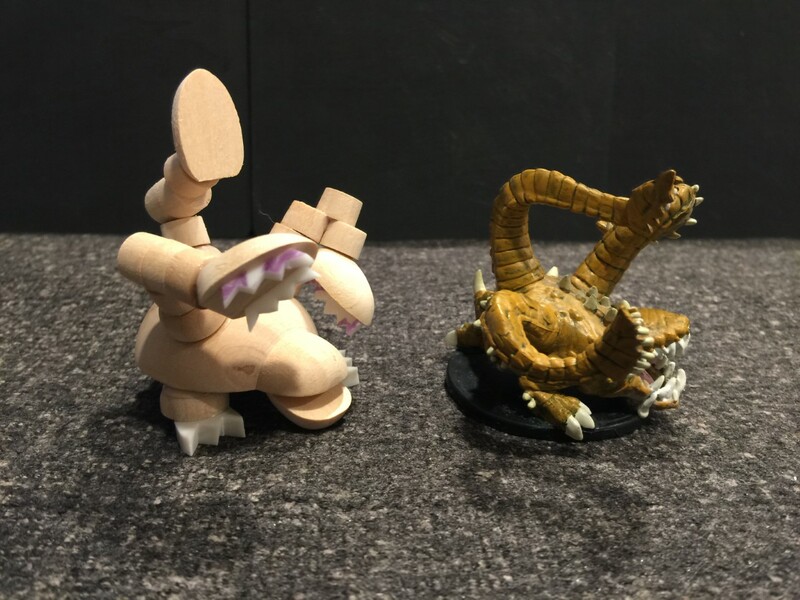 So here is my otyugh figure side by side with the pre-painted D&D counterpart. As you can see, the scale is nearly identical in terms of actual area taken up by the figure, which is one of the things I try and go for. I'm also happy with the general appearance of the otyugh at this point. 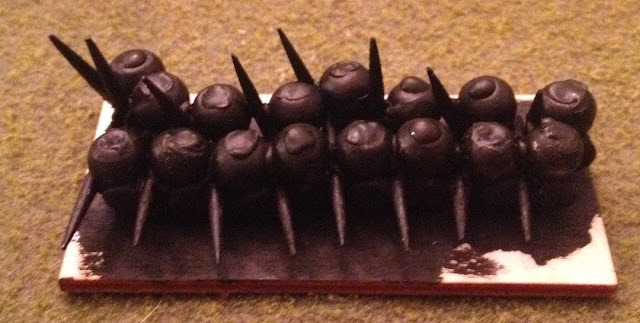 I cut tile spacers to make the "teeth" at the end of two of the tentacled arms. There is just one tile spacer per side, though, so essentially it is a thinned down long straight piece of tile spacer that I then cut a jagged edge on to look like teeth. Individual teeth would probably look better, but would be really fiddly and would be more likely to come off the figure with handling. I will paint on the other teeth in its maw because there just is not enough space to put teeth in there. I can't make the mouth any wider because as it is constructed now, the bottom of the lower jaw already is just mm from the table top. 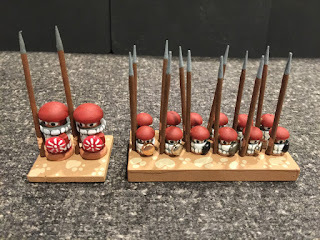 I also think I will paint on the spikes, but I did entertain using toothpicks or other wooden pointy things cut to size and glue them on. I still might do this, I haven't decided. I will need to decide this before I paint it. The issue is how likely I think they will be to break off with use. Obviously, I don't want that and if that is likely, it's not worth going for the 3D spikes, better to just paint them on. I also have a base done for him and painted already, but I will only glue the figure onto the base once it is painted. He is such a low ground clearance figure that painting the underneath of the figure would be next to impossible if I put it on a base first. I went with the tapered plugs for his arms, ending each in a split egg with its bottom filed down so that it is flat, making it look like it attaches to the tentacle. Although the tapered plugs do not give it a smooth look, I think they will actually add to the segmented tentacle arm look once its painted. But we'll see. 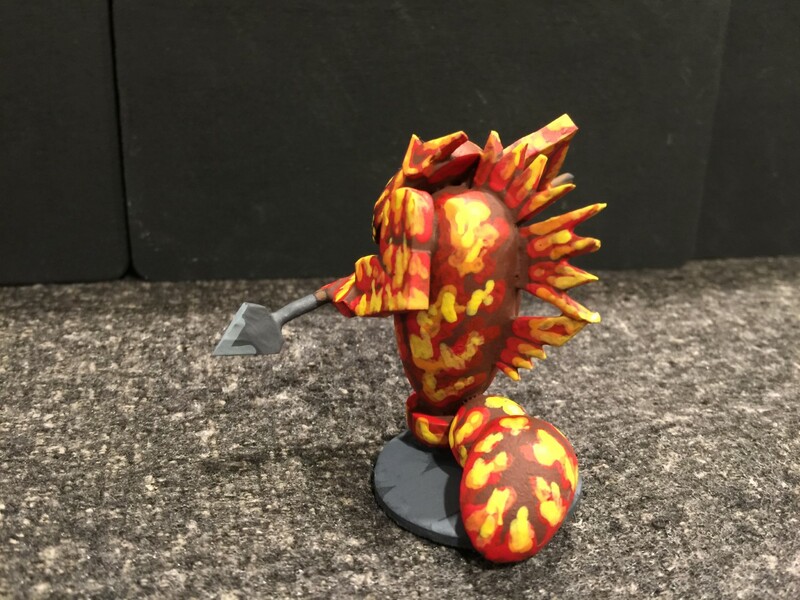 Hope you like the otyugh! Tomorrow I'll post something else, haven't decided yet what, either a painting example again or something else. Knowing that Dale would be away from his blog for a few days at this time, I have been hard at work doing some painting so that I could have some stuff to post while he is away. So here is some of the stuff I've been working on. I'll save other things for later in the week. For tonight, I'm posting about a salamander (the evil elemental creature of fire, not the cute little lizard), an orc shaman, and finally a dungeon accessory piece, a statue of the elven god of luck. I'll start with some "naked"/unpainted pictures and then show and talk about the finished painted piece. I actually started the salamander and then realized I needed an unpainted picture of him, so he has a little paint on him by accident. 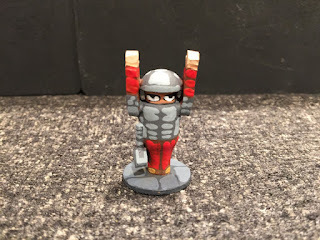 I put him with a finished human thief miniature for size comparison purposes. His construction is interesting, especially because his body is made of an egg that I cannot find anymore (it is longer and skinnier in shape than the normal eggs you get from online wood craft parts suppliers). These eggs I found randomly in a Michael's store one time, and they quit stocking them (they went on clearance sale) and I bought every package they had. But it won't be enough, I like this eggs a lot, I'm going to have to find them eventually online somewhere. 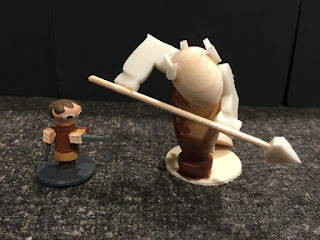 Anyway, he has a split egg head, long and skinny egg body, an axle cap for the bottom part of his body where it first makes contact with the ground (because it has a hole in it gluing it to the base upside down so the hole points up allowed me to really anchor the body of the salamander in place by gluing the tip of the egg body into the hole of the upside down axle cap). You'll see in another picture but there is one more axle caps that make up the lower part of his snake-like body ending in another split egg tail. I used tile spacers to make the arms (really big ones) and hands, and his ears. You'll see this in the next shot as well but I also used the large tile spacers, cut them in half so they are thinner, and cut them to make the shapes of his spiny back plates. The tip of the spear is also made from a large tile spacer I cut to the shape I liked, poked a little hole in it, and glued the stick to it by jamming it into the hole. You can really see his lower body here and back spines in this picture. Notice how I placed the axle cap and split egg in an overlapping position to give the sense of a coiled, snake-like body. At this point I was very happy with how he turned out, and was afraid to paint him for fear of messing him up. That painting delay is normal for me on these monsters because it takes me a long time to figure out how to make them, and then after I do that I am afraid I'll mess them up when I put paint on them. He literally sat on my painting table for about 3 weeks. Above is the naked version of the elven statue of the god of luck. The base is a 1 1/4" square piece with a 1" cube glued to the top of it. I knew from the beginning that I wanted to put the elven word for "luck" on the front side of this block, but I would paint it on. The body is a longer shaker peg (I can't remember the size, but it's probably about 2 1/4" long I would guess). I cut the bottom off of the shaker peg so that I could glue it flush to the cube. The cowl and head construction is the same as for the lich I talked about earlier (split egg with an axle cap glued hole-side down). The arms are in a praying position and made from tile spacers. The hands are separate tile spacers cut to shape and glued into position. That's all there is to this statue! The picture above is the base colors for all the figures. 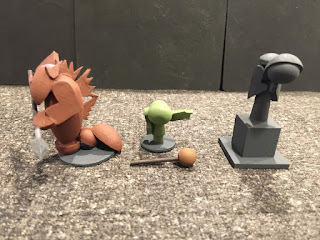 Dark gray for the statue and the bases of the figures, dark redish brown for the salamander, and a color called Light Avocado from Americana craft paints for the orc's flesh. I like it because it's green without being "too green." Each figure has been painted twice. One coat with the cheap craft paint always proves to not be enough for these fantasy figures (you can sometimes get away with one coat with the historicals). But after two coats, the color as you can see is consistent and vibrant. 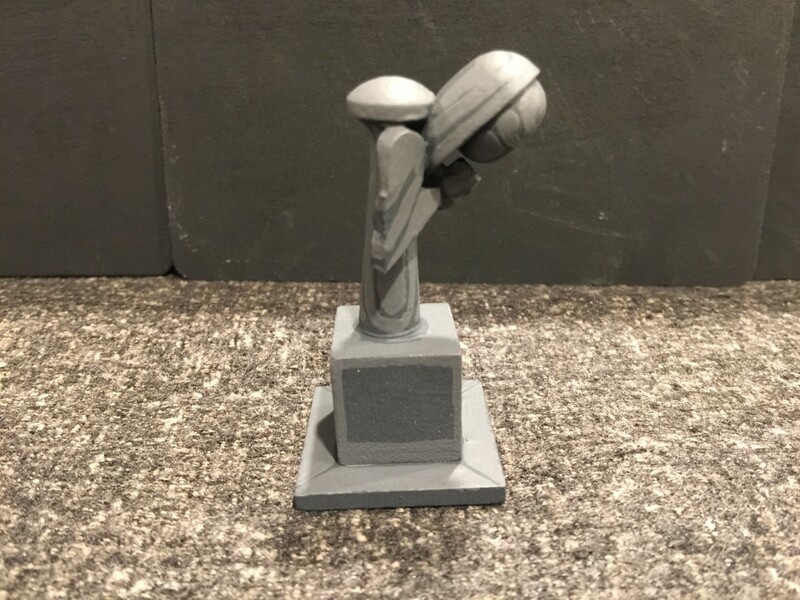 Here is the finished statue. 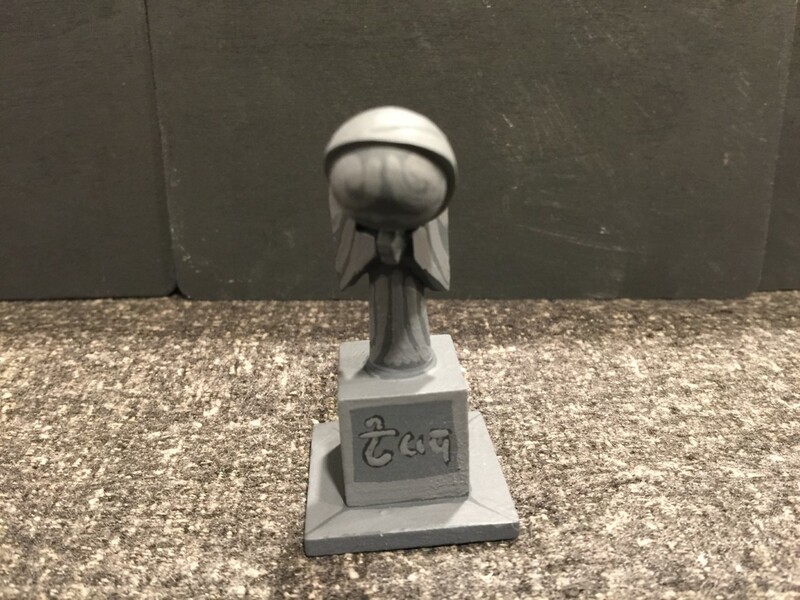 I just took a lighter gray color and literally made it up as I went, just painting a basic cloak look to her with a simple face (can't really see anything but her hair pattern in this picture). The text is actually painted black first, and then the lighter gray on top of it. The black makes the letters pop out more than if I had used an even darker gray. The lighter gray color I usually only have to paint once, and that was the case here. 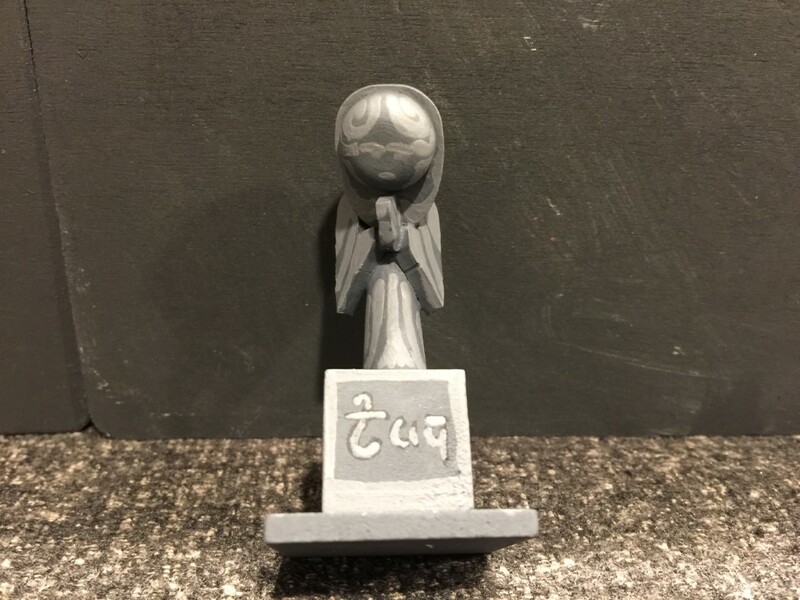 Here are some more pics of the statue. As you can see, I only painted the text on the front. Why? Because I am free handing it, and because it is elven letters (which I have never painted) I knew there was NO way I could possible get all the sides to look the same. So I only painted the text on the front side. You get a better sense in this picture for the "draped" look of the cloaked body. 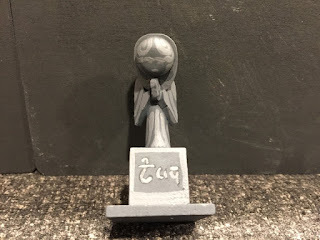 When you are painting something on a flat surface like you have with these figures, what you leave behind as unpainted space (in this case the dark gray color) is as important as what you cover up with the new color. By leaving the darker color exposed, it creates the illusion of depth. You can see her face a little better here. I didn't want it to look too "human" because it's a statue of a god, so I went with lines with dots under them for eyes and just the suggestion of a mouth. It is tilted back in this picture so that you can see the face better. I have done a lot of orcs before, but never a shaman. I knew I wanted him to hold a staff with a skull on the end. 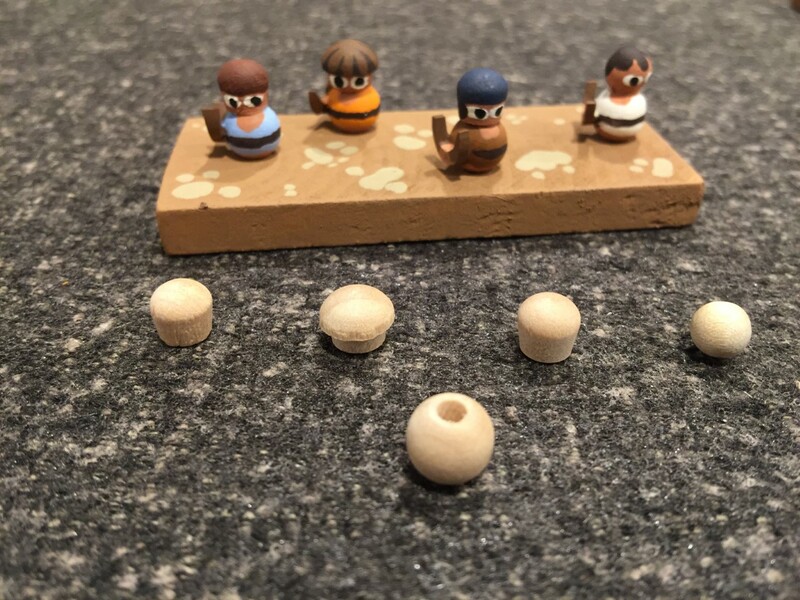 In this case it's just a round bead that I glued to a small stick. The figure is the normal orc construction with an axle cap head glued onto a shaker peg so that it looks like he is hunched over with the worst posture in the world. The arms are tile spacers, the right bent at a 45 degree angle which is perfect for holding the staff, and the left is extended in a pointing/spell casting gesture. As far as the paint job, nothing too earth shattering here except that I wanted him to have a fur for clothing, so I painted the dark brown color where I wanted it to be, and then just blobbed on into some of the dark brown area lighter brown to create the "fur" look. I gave him some blue face paint for casting his spells and for appeasing his god. Notice that the way I have figures "hold" things is to glue the object to the bottom of the arm. The tile spacer arm is flat and creates a good area for the shaft of the staff (in this case) to glue onto pretty well. Then I paint the fingers actyakkt on the object held to make it look like the figure is grasping the object (hands wrapped around the object). Silly, I know, but I think it's effective. 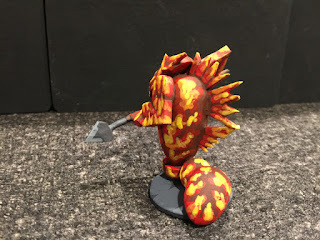 The salamander I am going to do in stages hopefully so you can see better what I did. I took the dark brown color and blocked out his eyes and mouth. 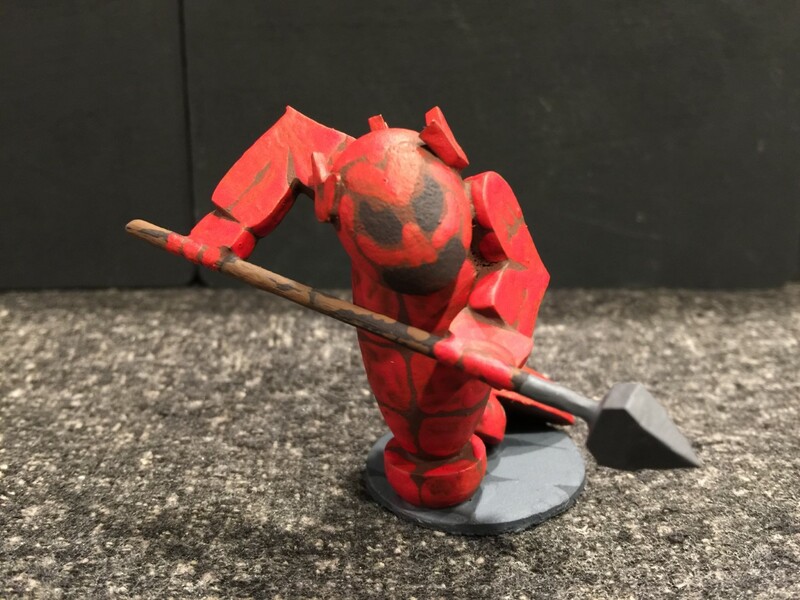 Then I took bright red and painted the various serpent-looking parts of the body, and the humanoid parts of the arms and hands, again painting the fingers onto the object being held to create the illusion of the monster holding the spear. 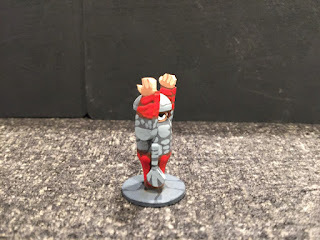 It is very important that you leave uncovered some of the darker color you painted onto the figure before the current color you are painting (bright red in this case). This is what creates the textures and the folds in the clothing of other figures. In this case, it created the segmentation of the creature's body and arms. If you don't do this, you'll just have at this stage a monocolor red figure. Not what you are going for, trust me. As you can see, I've already finished the staff of the spear and put the base coat of medium gray on the spear tip. You can really see the importance of not painting over everything with the new color (in this case the new color is the bright red). Leaving behind open darker spaces gives visual interest to the figure. 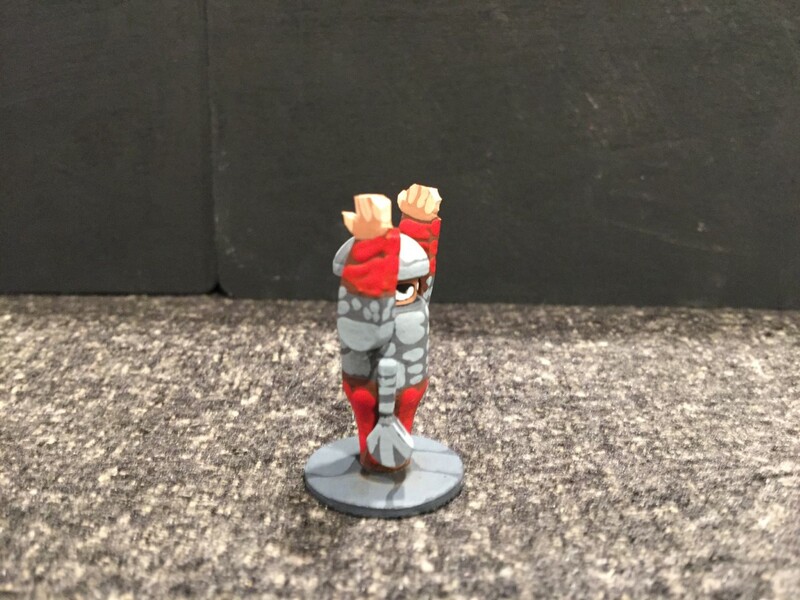 This is vitally important on the larger figures like this one, less so on the human-sized guys. Over the red I painted some orange (you can still see some of it in this finished figure) and over the orange I painted some yellow. In both cases, I did not paint over top of the previously painted color completely, leaving some of the old color still visible. This is very, very important! Are you tired of me saying this yet? 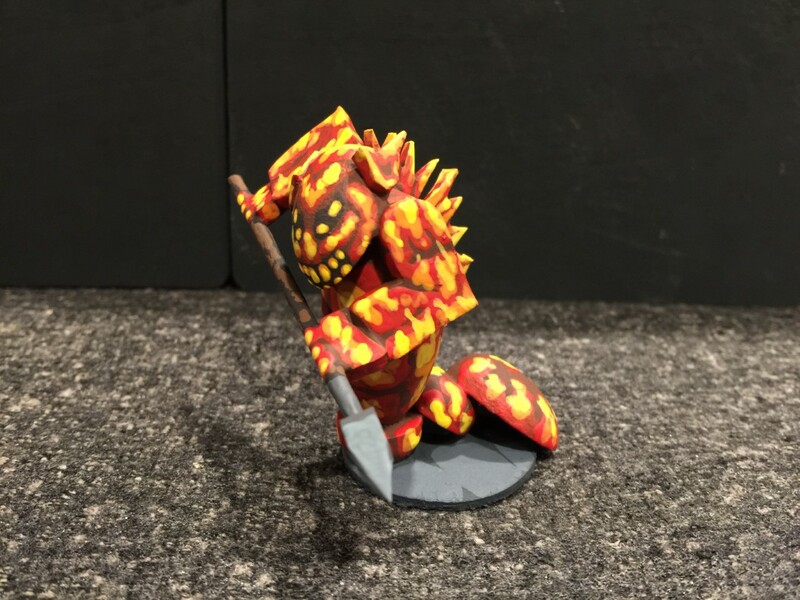 Final picture is of the salamander with some adventurers on a painted tile just to give you a sense of how bright and "on fire" he looks. I'm pretty pleased with how he turned out. Have you ever purchased a new rule book for a new period that you have no figures for and then said: "Boy this is shiny and new. I wish I had two armie for this period so I could try these rules out!" Okay, I may not have said it that way, but I have said something like it. I think we have all thought it at one time. 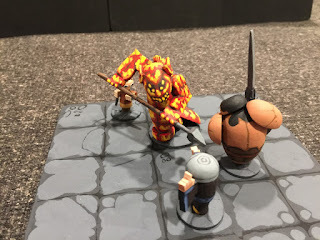 Created paper armies where you print and cut out paper figures and mount them to bases. Generally the figures are all side-view, so you have to play from the side, rather than from behind your troops, otherwise it does not look very good. Created paper armies where you print groups of top-down figures and mount them to bases. These are essentially fancy boardgame counters. No reason not to use flat terrain too! Created elaborate drawings using computer programs like Battle Chronicler to register the moves of the electronic versions of the counters I used above. Bought and painted (or had painted) 6mm metal or plastic figures and mounted them to bases. I was feeling a bit nostalgic last week and I created a few of the "Bead Knight" of my childhood. (See the post Let's Get Medieval and scroll down to the middle to see the results.) I brought back a lot of memories, but it also prompted a conversation with blog co-author Matt about how to solve the "ooh! New Shiny" problem by making your own armies. 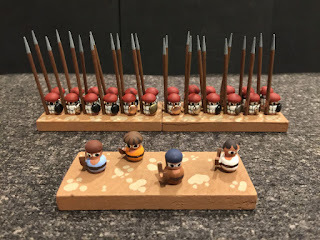 Yes, making miniatures takes time, but by making the figures a certain way, would it be possible to make the whole process, from start to finish (armies on the table), quicker? The real beauty of these seems to me to be rapid construction and ease of construction, and the flat surfaces allow you to focus on what you want to paint for each figure and putting the signature detail there rather than worrying about all the little fiddly stuff on the smaller figures that no one sees on the gaming table even with highly detailed metal sculpts. You can see them when you hold them up 6 inches from your face, but on the table? All you really see is what you painted on your guy, which is the helmet, the covering for the horse, and the weapon/shield. 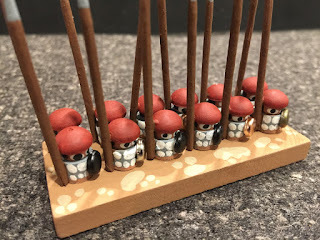 The point of these wooden warriors in my view has always been less about making an equivalent wooden figure in detail compared to a metal sculpt, but instead to create a quicker to paint, lighter to carry figure that on the table in a gaming situation allows the person playing from 3+ feet away to say "those are knights" or "those are American WWII GIs" or "those are Macedonian skirmishers" or whatever. The second part of that thought is that because the detail is not cast on the figure, there is a lot of incentive not to paint that detail. 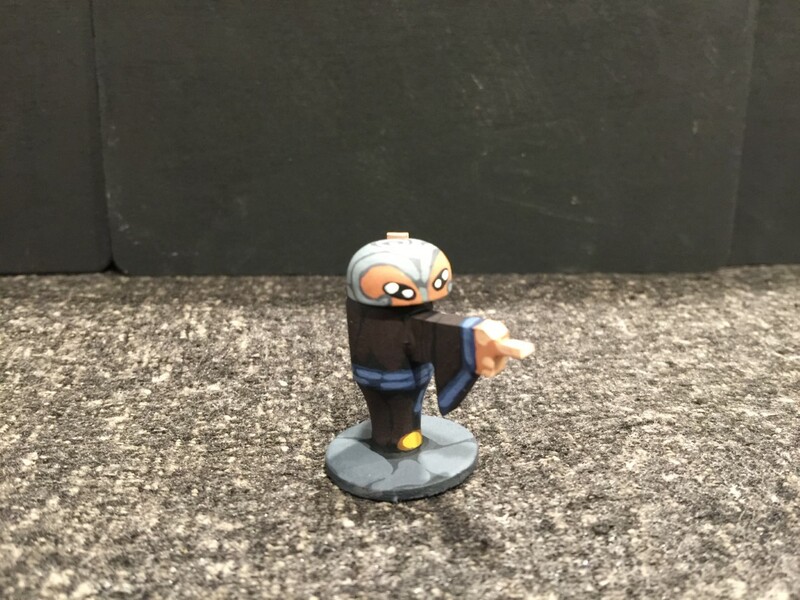 If you have ever painted old Scruby figures, you know what I mean. 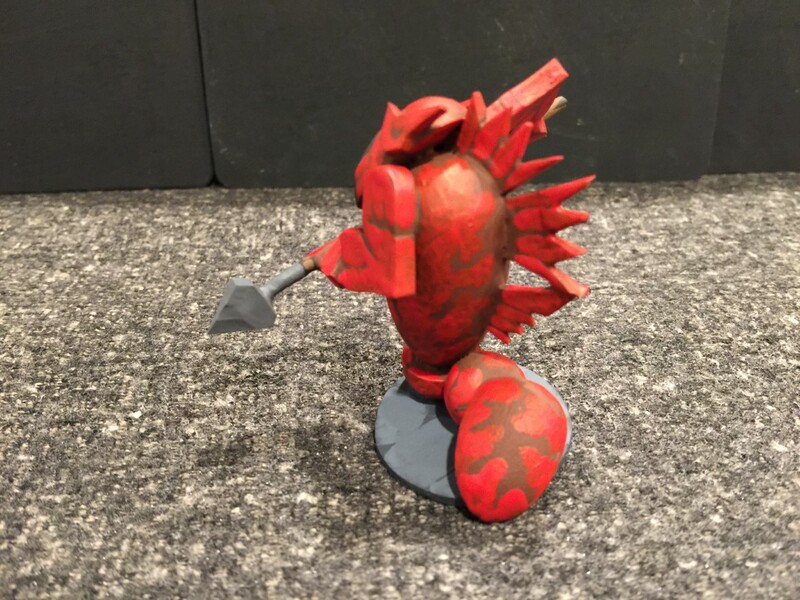 Scruby miniatures conveyed the shape, but rarely had cast details. So you could ignore the elements that would not normally be visible, like buttons. 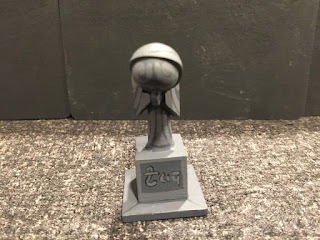 If the buttons are cast on, however, they will likely be wildly out of scale (in order to be visible) and will be noticed as not being painted when the figure is closely inspected as the detail casts a shadow. Another issue with cast detail is that even when you want to paint that detail, say the shako cords or a metal device on a cartridge box, if you don't paint dead on "between the lines" you will notice it and try to correct. It is just human nature because when you are painting you are looking at the figure up close – probably closer than anyone else ever will – and these "flaws" leap out at you. Without the detail cast on it is very easy to paint the detail where you want, how thick or thin you want, and how straight or rough you want. The non-uniformity of the figures then actually looks more realistic. One set of rules that I wanted to try out, but had no armies for (despite having a number of DBA armies), is Dux Bellorum. They looked interesting, but later I heard that there was a flaw, but then others said that no, it was a great game. I wanted to find out myself. But how much time, effort, and money did I want to put into a period that I had no troops for, for a set of rules that may be flawed? Not much. So in comes the idea of making my own miniatures, using this minimalist approach. First, I set off for the local Hobby Lobby and purchased several packs of beads. You can see the product of maybe an hour's worth of labor as I was still figuring out how I wanted to build these new figures. (I will do a construction article next time, after I return from my business trip.) Basically I have a Saxon shield wall on the left and a group of Norman Knights on the right. Each Saxon figure consisted of two beads, one-half of a round toothpick, and a sequin for the shield. The horses are actually made up using six beads, and with two beads, one-half of a round toothpick, and the top of a flat toothpick for each rider. 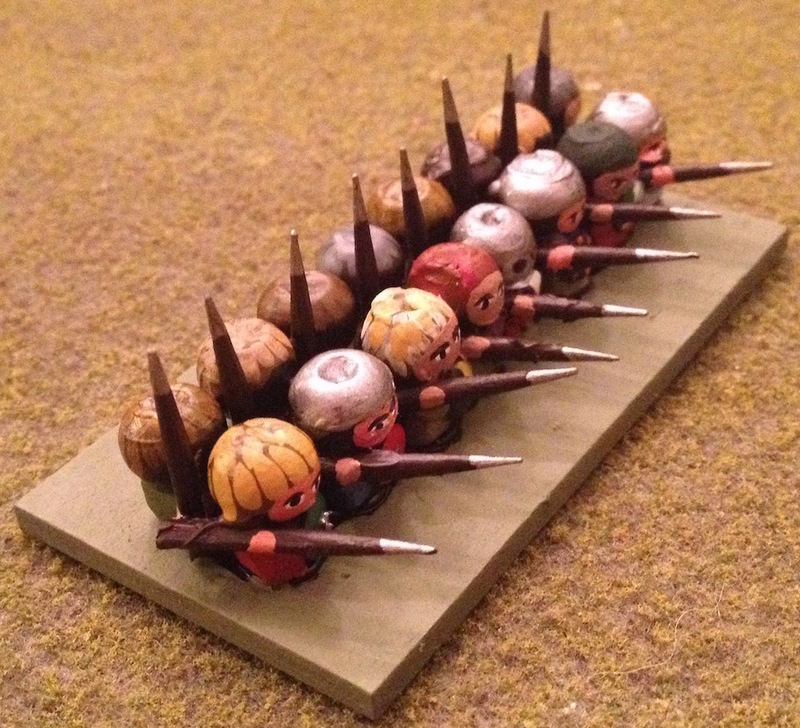 There are 16 infantry to a shieldwall base (12 for loose-order infantry and eight for skirmishing infantry), mounted on a 3" by 1 1/2" wooden base. 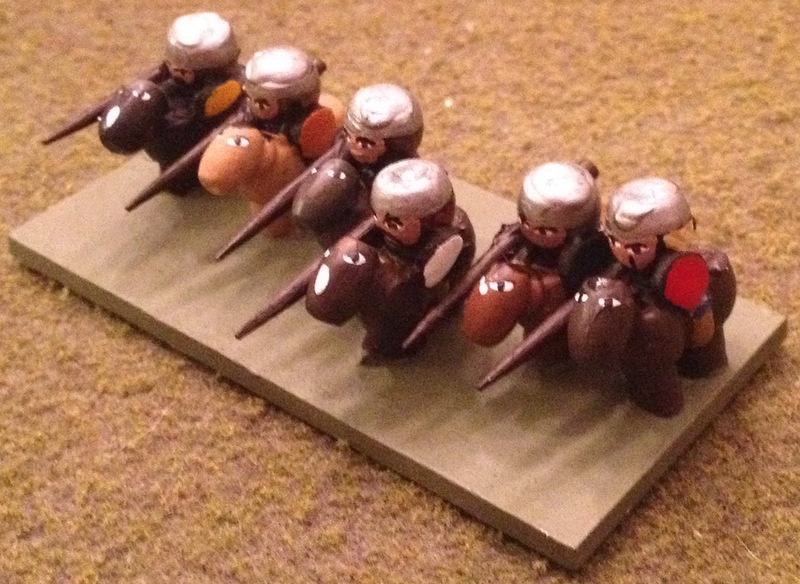 There are six Knights to a base, but there will only be five for lighter cavalry and four for skirmishing cavalry. Of course, the key to minimalism is to paint minimally! I could not resist painting the eyes. I can paint eyes pretty fast and I think it does matter, especially with the horses. As Matt was saying, the principle items that you eye sees are the distinctive or "iconic" elements. For a Norman Knight that is the teardrop-shaped shield, the helmet, and the spear/lance. Everything else is essentially de-emphasized (surcoat is a simple blob of paint on the front and the back) or unpainted (using the black gesso primecoat to act as shadow). There are so many details that could have been added on or painted, such as horse furniture and tack, swords, rider legs, horse's hooves and ears, etc. but even with these close-ups did you initially notice that they were missing? Does it really matter now that you have been alerted to take note? To me the idea of minimalism is not minimizing the detail you do paint, but maximizing the number of details that you don't paint. These guys took very little time to construct and paint up. The only thing I would change is that I would construct them with Gorilla Glue-brand super glue, rather than with hot glue. These figures are just too small for wielding a glue gun and the strings get to be a constant pain to remove. Where hot glue comes into its strength is to fill gaps between parts. These can be painted with black gesso and then they become shadow. 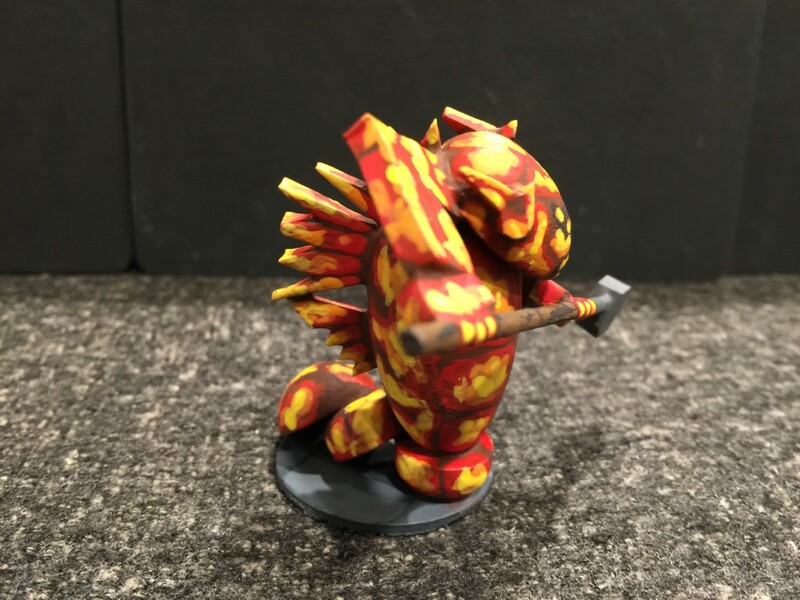 While I am away on my trip I will definitely be sitting in the hotel room with a few bags of beads and some super glue, making my Dux Bellorum army. Then I can start painting them when I return home.